The financial industry developed tremendously in recent years due to the technological developments and alongside with that, new and more complex trading instruments had become available, not just for institutional investors but for ordinary people like yourself. This material will focus on four advantages of binary options trading and show you what are the key reasons for why you could trade them. Why is binary options trading so popular these days? When it comes to these instruments, there are some key features that make them unique. The following traits are four of the most important ones that can make you decide to invest using binary options. Fixed risk- since you know from the start how much you can earn and how much you can lose you can develop a proper risk management model that can help you avoid blowing up your capital and manage to attain consistent results. Variety in terms of assets available for trading – with binary options trading you have the availability to trade a few thousands of instruments across different markets, allowing you to diversify your portfolio. Easy for beginners who just started trading – compared with other assets that are harder to understand when trading (like stocks, for example) trading binary options is easier since it does not require complex knowledge about the financial industry. Quick results – with an effective trading strategy and a well-designed risk management system + the discipline to apply diligently the rules that you’ve set up, you can acquire great results in a short period of time. These are four of the advantages you can benefit from if you choose to trade binary options. However, we would like to emphasize again that trading is not easy, not matter in what market you are investing, so just because use have those advantages, that does not mean you don’t have to work hard in order to achieve great results. 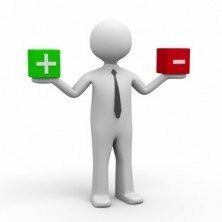 In our next material we’ll focus on some of the disadvantages of binary options trading, so you will know what are the main risks if you choose to invest in this market.